Do you remember Faygo Uptown’s ‘too pooped to participate’ Herkimer? Faygo had a set of pretty great advertising behind “Uptown,” a lemon-lime pop that gave folks a lift. 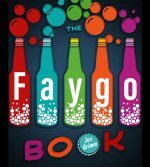 The campaign included TV commercials, store signs and, as I learned doing presentations about The Faygo Book, a limerick. The center of attention for all the commercials was Herkimer Bottle Blower, a sadsack cartoon character who worked in the Faygo plant blowing bottles and whose one-quart lungs started blowing in half pints. That can cause quite a bottleneck! Geri Daly recalled the limerick and, with a little encouragement, recited it for the crowd at a presentation before the Grosse Pointe Historical Society. Incidentally, that was the first of what will by late summer be more than 100 Faygo Book programs. You can get the calendar here. His job was to blow 90 quart bottles a day. One day his breath started coming in short pints. This Uptown display towers over Faygo co-founder Perry Feigenson, in the hat, and his nephew, Phil. Faygo Book photo from the Feigenson Family archives. Next Post They will even have Faygo!